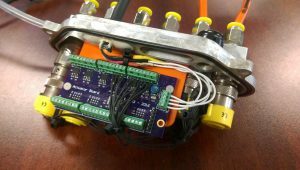 For the 2016 competition season, our actuator board has been re-designed. This board supports 12 actuators and 12 limit switches. This board uses a STMicroelectronics STM32F0 processor and communicates to our vehicle over a RS485 connection.